We over-shopped the other day when we set out to make Bananafish, so today I had a bunch of extra tilapia that needed to be dealt with. 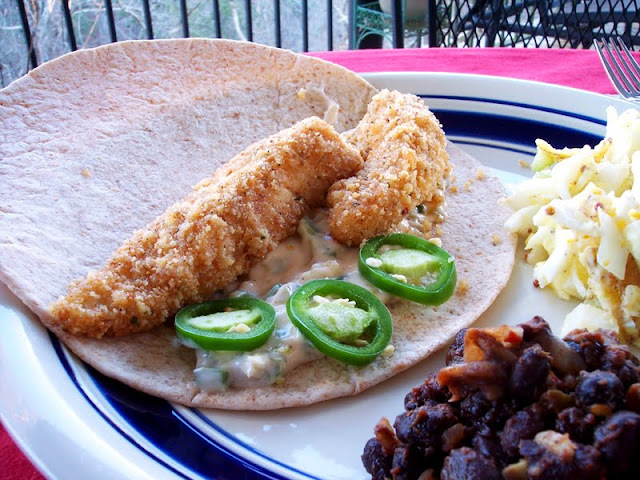 Seemed like a great excuse to take a crack at an old favorite, the fish taco. First, I stood back and asked myself: Kristina, what do you even know about fish tacos? They’re usually made with fried fish. Hrm. I hate fried fish. Quality is key. If I wanted a dried-up piece of processed fish with mayo and some relish, there are a dozen fast food places on our street. COME ON. Less is more. Atlanta’s Taqueria del Sol serves my favorite fish tacos, with nothing but fish, peppers, and tartar sauce. Six Feet Under, on the other hand, serves some of my least favorite, with jalapeno slaw, which is fantastic on paper but overwhelms the fish. Ah, look at that, I thought. I have no idea what I’m doing. Rinse the fish and cut it into 3/4″ x 3/4″ x 4″ strips. In a small bowl, melt the margarine. Add the coarse mustard and garlic powder. Crush the panko so it’ll be a bit finer, either by massaging it while it’s still in the bag, or with a mortar and pestle, or in a food processor. 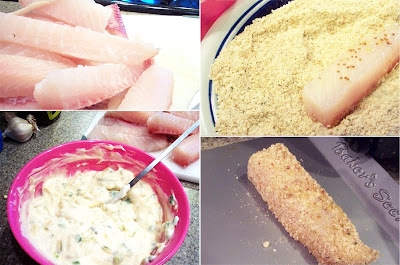 In a shallow dish, mix the panko, the bread crumbs, salt, pepper and parsley. Make sure the fish is dry (paper towel if you need to). Roll each piece in the margarine/mustard mixture, then coat it in the bread crumb mixture, and lay it out on a teflon- or oil-coated baking sheet. Place it into the oven and cook 8–10 minutes on each side, or until flaky and lightly crisp. While the fish is cooking, mix all the tartar sauce ingredients in a little bowl. Stick it in the fridge until you’re ready for it. Assemble the tacos. You don’t need me for this part. 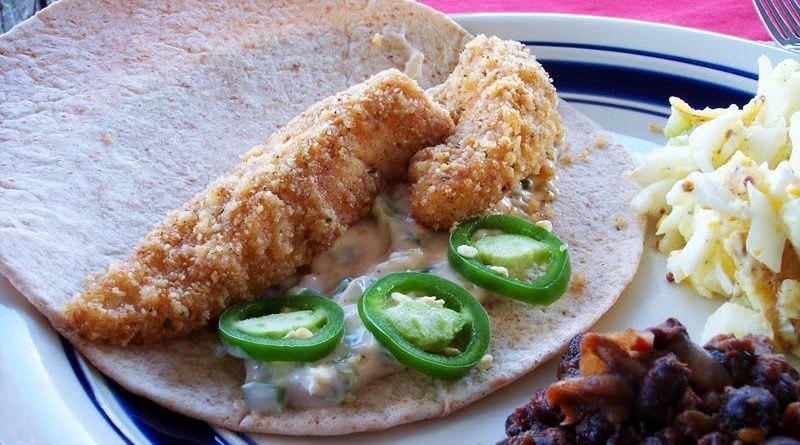 Grab a tortilla (it’s a good idea to warm it up first, but hey, it’s your taco), spread tartar sauce on it, stick a couple fish sticks in there, and add as many jalapeno slices as you want/need/can stand. Serve immediately, while it’s still hot. Maybe pair it with some nice black beans (also a tasty addition to the fish taco itself, if you care to put some inside), Squish-Free Potato Salad and a cold cerveza. I mean, I don’t know. Just thinking out loud.